We drove from Swansea along the M4, the car buffeted by gusting winds, windscreen wipers swiping away the rain. We parked at Bridgend recreation centre and walked along a concrete-lined service road and past a wet playground. 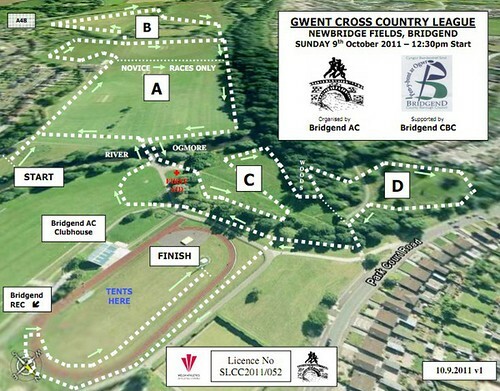 There was the race HQ — Bridgend Athletics club. Isobel was nervous. What time is it? There should be a tent. Stay close to me. Is that Andrew? What time is it? There were lots of tents and lots of tall track-suited men who could have been Andrew. Striped tape stretched between plastic posts, marking out the route. There was the finish line. The PA system chattered away. 7 minutes till the novice boys’ race, the first event of the day. We found the Swansea Harriers tent and reported in. £1 for the under 13 event, £4 for seniors. Isobel fell in with some friends and was gone. I walked over the bridge and onto the fields, heading for the start. The novice boys were on the course now, stretched in a line between the river and the rugby pitch. Spectators struggled to control umbrellas. Dogs tugged at leads. Isobel found me again, wanting to hand over her clothes. Half an hour, I said. Keep warm. Do you need the loo? Are you thirsty? I’d keep those on, really, don’t get cold. But she wanted to be ready. The novice girls swung round towards the bridge. The first runner passed, straight-faced, serious. She wouldn’t be caught. More lone front runners, then clumps. Go on! Well run! Towards the back, tears, girls walking, being urged to push on. 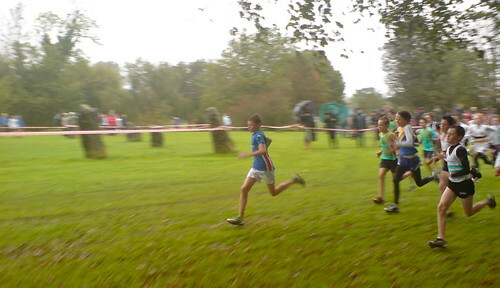 The under 13 boys’ race now. They shivered and twitched then set off at a sprint. Isobel was with her team getting final words of advice. The under 13 boys were on their way back. The leaders hadn’t slowed down at all. The girls lined up. Over a hundred of them, I should think. Aberdare, Aberystwyth, Barry, Bath, Bridgend, Bristol, Caerleon, Cardiff, Carmarthen, Chepstow, Gorseinon, Griffithstown, Llanelli, Lliswerry, Neath, Newport, Pembrokeshire, Penarth, Pontypridd, Port Talbot, Porthcawl, Rhondda, Stroud, Swansea, Taunton, Wells, Westbury, Weston. She ran well, at a steady pace. I cut across the course to cheer her on at different points: by the river, at the bridge, near the woods, and I was there waiting at the finish line. 56th. I hugged her. Well done! I need spikes, dad. So muddy, I mean it is soooo muddy! I’m really pleased, are you pleased? I didn’t stop and walk. You did really well, I’m proud of you. Really well. Yes, my turn. I got Isobel’s kit, made sure she put it on, gave her money for a snack. No surprise to see Ifan Lloyd. I’m guessing you know this course, I said. You could say that, yes. Yes, you could say. I knew I wouldn’t see much of him during the race though. 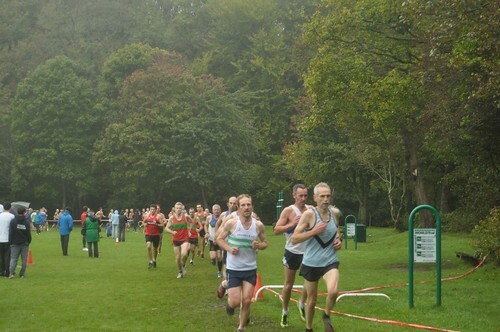 And there was Gary Irving, captain of the Welsh Castles Relay team, taller and thinner than ever. Was I over 50? No. Shame! We’d have had a useful M50 team. Younger seniors crouched in the tent, swigging drinks, selecting footwear, unpeeling tights, rubbing muscles. I had stopped following the races now but was aware of the different age groups out on the course tracing different circuits different numbers of times, crossing and re-crossing. Some of the route posts had fallen over and loose tapes got trampled into the wet grass. The first senior women had finished, muddy and flushed. I got changed. Had a drink. Checked my laces. Queued for the toilet, then needed to go again. Jogged around the field. Now I was walking across the bridge to the start line. 5 minutes till off. And now we were off. I fell into position in the middle of the pack. We passed the stone circle which marks the place where the Eisteddfod was held. Go on daddy! There was Isobel with a friend. Come on Swansea! We ran through mud churned by previous runners. I clung to the edges where the grass gave more traction. Downhill, I followed the slope, not the route. I slowed into corners, took them wide, then pushed on when we hit gravel and harder ground. Bang, man down! A sniper got him. Uphill in chopped strides, looking for footholds. Isobel appeared again. I waved, feeling good. The lead runners swerved ahead, rattling round far corners of the course. On the second lap I started moving up the field. The heel of my right shoe was too loose and stuck in the mud. Lace up more tightly next time. Field, field, woods, bridge, field. 3rd and final lap. I had something left. I charged for the line and funneled in, collecting a cardboard position token to be handed to my team manager. Seasoned runners bring two bottles of water. One for drinking, one for washing. A sign at the recreation centre said cross country runners were not to use the facilities but we did anyway. The next day the results came through, and an email from Kevin Corcoran. It was an outstanding day for the Senior Men with wins for Dewi Griffiths (Senior Men & Under 23), Mark Roberts (V40) and Ifan Lloyd (V50). Dewi led our men to team victory over Cardiff and we also won the B Team Division in the process. My thanks to Chris and Maxine Fulcher for allowing me to take a copy of their fine photo. More of their photos of the event can be found here.